For those who don’t know a labyrinth is actually another word for maze. It is a word that comes from Greek mythology expressing a complex building that would make it hard to dind things. Specifically designed to protect artifacts or special items. Mazes have been around since the beginning of time. In today’s video I show you how to build amazing maze labyrinth game for 2 person team. It’s not so easy to play as it seems at first sight. If you want pass any level, you need to play as a team. Also, you can change level to another more difficult or easier one. You really need to try this exciting game. Labyrinth is a game of physical skill consisting of a box with a maze on top with holes, and a steel marble. 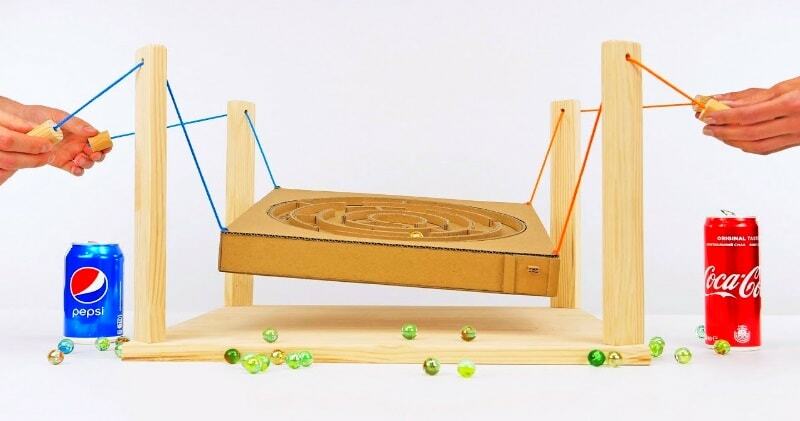 The object of the game is to try to tilt the playfield to guide the marble to the end of the maze, without letting it fall into any of the holes. Some versions of the game feature a suspended maze surface that rotates on two axes, each of which is controlled by a knob. Small handheld versions of the game are sold, with the box being completely closed with a transparent cover on top.